Editor’s Note: This week we’re at the 231st AAS Meeting in National Harbor, MD. Along with a team of authors from Astrobites, we will be writing updates on selected events at the meeting and posting each day. Follow along here or at astrobites.com. The usual posting schedule for AAS Nova will resume next week. Astrobites at the undergrad orientation. We loved getting to chat with so many students at the undergrad orientation and reception on Monday night! It was great to hear about your research projects, your goals for the future, and the things you’re passionate about. 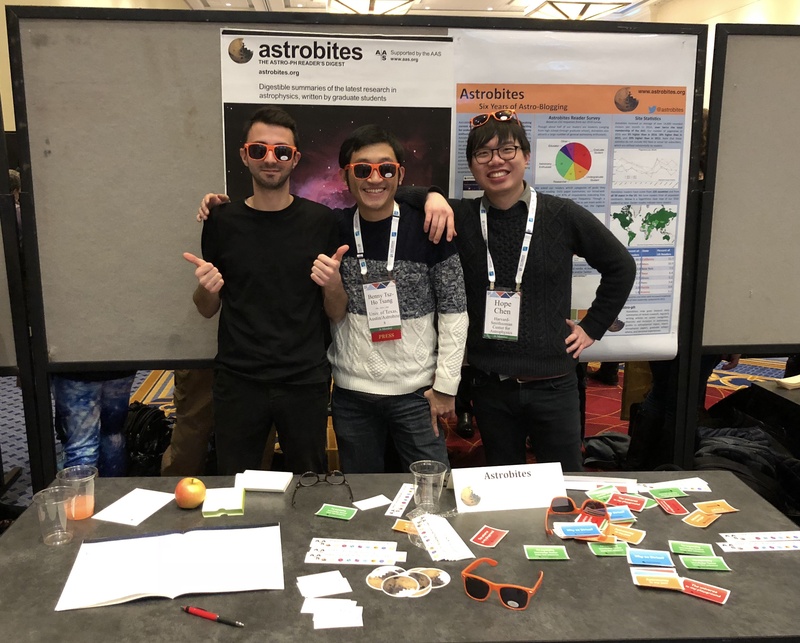 Keep on being awesome, remember that we want to hear from you about your research, and let us know if there’s anything we can do to help make your entry and progression through the field of astronomy easier. Scott Bolton of the Southwest Research Institute, who serves as the Principal Investigator of NASA’s Juno mission, reflected that before his graduate student days, it seemed like scientists knew everything; results were reported with so much confidence that it seemed that there were no puzzles left to solve. Luckily, that’s far from the case, and the Juno mission is a great example of how new results can topple long-held beliefs and open old topics to new ideas. Juno sweeps close to Jupiter once every 53 days (the closest approach is known as perijove), careening just a few thousand kilometers above the cloud tops, traveling pole to pole in about two hours, and steadily marching along in longitude to make a map of the planet. The Juno mission has upended established theories about Jupiter’s atmosphere, interior structure, and magnetic field. For example, there is more lightning at Jupiter than anyone anticipated, especially in the northern hemisphere. White clouds — possibly containing ammonia ice — are ubiquitous. The magnetic field has stronger high-order components than expected, and unexpectedly peaks in strength closer to the equator than the poles. The auroral trace of the volcanic moon Io has a split tail. In addition to these individual discoveries, the Juno mission highlights the fact that the four seemingly separate foci of the mission — origins, interior, atmosphere, and magnetosphere — are more interconnected than originally thought. No Juno presentation could be complete without some gorgeous images from JunoCam. (You can access raw JunoCam images and weigh in on where the camera should look next on the JunoCam website!) After a long approach to Jupiter, the first look at cloud formations on Jupiter’s poles didn’t disappoint; the south pole is dotted with storms arranged in a pentagon, while the north pole sports a stormy octagon. With each successive perijove bringing new and intriguing results, Jupiter surely has more surprises and more theory-toppling in store. Dr. Bolton closed the session with a message for the current crop of young investigators: Keep working on the theories, and don’t believe your professors! The first press conference of the meeting kicked off with a look at some of the latest results from the SOFIA mission. 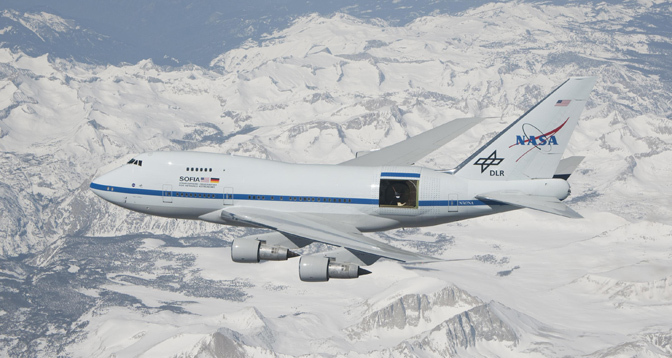 SOFIA’s one of my favorite missions — it’s a big plane flying with a garage-door-sized hole in its side for an infrared telescope to point out. What’s not to love? 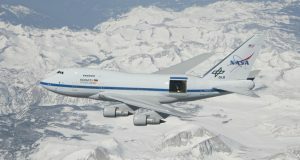 SOFIA’s flights put it above 99% of the Earth’s water vapor, allowing it to make infrared observations that are impossible to make from the ground. First up, Kimberly Ennico (NASA Ames) provided a broad overview of SOFIA and its different instruments. SOFIA’s instrumentation is renewable: the team regularly swaps out the instrument that flies on its observing runs. Today’s announcements focused on initial results from the new High-Resolution Airborne Wideband Camera-Plus (HAWC+) instrument and outcomes from the German Receiver for Astronomy at Terahertz Frequencies (GREAT) instrument. The HAWC+ instrument provides both far-infrared images and polarimetry data, allowing us to explore the structure of galactic magnetic fields. Enrique Lopez Rodriguez (USRA/SOFIA Science Center) presented the first detections of polarized far-infrared emission from external galaxies, which can be used to infer the large-scale structure of the galactic magnetic fields. In particular, he showed contrasting observations from two different galaxies: M82, a starburst galaxy with large magnetized outflows, and NGC 1068, a massive spiral galaxy in which we can see a magnetized spiral arm. B-G Andersson (SOFIA / USRA) gave an overview of some of the theory behind polarization and how it traces magnetic fields. In one model, radiative alignment torque theory, radiation from stars hits dust grains and causes them to spin up. Once the grains are spinning, they interact with magnetic fields, causing the grains to align. Various recent polarization measurements made with SOFIA/HAWC+ seem to support this theory. Evidence for this from HAWC+ observations was presented by Fabio Santos (Northwestern University), exploring magnetic fields within galaxies. SOFIA/HAWC+ looked at one of the closest star-forming regions to us, Rho Ophiuchi, and demonstrated that the polarization of the dust grains in this interstellar cloud depends on the density within the cloud. These observations support radiative alignment theory: dust grains on the outskirts of the cloud receive more sunlight and align with magnetic fields more readily, whereas dust grains in the dense cloud interior receive less sunlight and don’t align effectively. Elizabeth Tarantino (University of Maryland) rounded out the session with a discussion of what SOFIA/GREAT observations have revealed about how gas cools to form clouds and collapse into the stars we observe today. The incredible resolution of the GREAT spectrometer allows us to make measurements of ionized carbon within star-forming regions in other galaxies. From these measurements, we’ve determined that both atomic and molecular gas contributes to cooling of gas — but in different ratios, depending on how actively the region is forming stars. These observations are crucial for understanding the initial stages of star formation. The press release corresponding to this press conference can be found here. Adam Riess (Johns Hopkins University) is an expert in precisely measuring the expansion of the universe. In fact, he won a Nobel Prize in 2011 for his role in proving that the universe is not only expanding, but also accelerating in its expansion. These days he works on getting as precise a measurement as possible of the expansion rate in the local universe. In today’s plenary, Riess discussed the recent tension between the local and distant measurements of the Hubble parameter, H0. Currently there is a 3.4-sigma discrepancy between measurements by Riess’s group of H0 in the local universe and the value determined by the Planck collaboration from the cosmic microwave background (CMB). Riess did point out that “it’s not a discovery until 5 sigma,” however 3.4 sigma is certainly interesting, and it sounds like Riess and his group have exciting plans for reducing the errors on their measurements. In fact, Riess said that his goal is to go from 2.4% to 1% errors on the local measurement of H0 within the next 5 years, before the end of HST. An important component of this is incorporating the upcoming proper motion measurements from Gaia. Although he’s still working on improving his measurement before fully accepting the H0 tension, Riess made some suggestions as to possible physical explanations for the difference between the local value of H0 and the value determined from the CMB. One possibility is a new species of relativistic particle. Riess said his particle physicist colleagues have no trouble inventing new particles without messing with accepted physics. It is also possible that dark matter isn’t completely collisionless. Interactions between dark-matter particles and radiation in the early universe could lead to differences in H0. This is an exciting time for cosmology — it is unexpected results like this discrepancy that reveal the most exciting new insights into our universe! You can read more about Riess and his work in an interview by Amber Hornsby. In addition to today’s press conferences, the AAS Press Office also hosted a seminar for science writers providing an overview of the upcoming Transiting Exoplanet Survey Satellite (TESS). The seminar kicked off with a broad look at the TESS mission and its science objectives, provided by George Ricker (Massachusetts Institute of Technology). 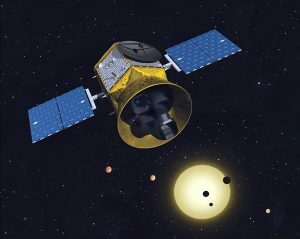 TESS is slated to launch in March of this year, and it will survey an enormous field of nearby, bright stars, searching for small transiting exoplanets. The mission pipeline doesn’t end when TESS discovers objects of interest. Sara Seager (Massachusetts Institute of Technology) described how these objects then get sent on to the TESS follow-up program, which involves hundreds of people around the world. 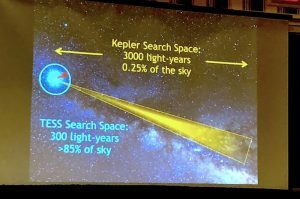 Seager discussed the expected outcomes from TESS for planet discoveries: we may find 70 or so Earths, hundreds of super-Earths, and thousands of sub-Neptunes. The planets discovered with TESS will be orbiting bright stars, making them excellent candidates for follow-up with observatories like the James Webb Space Telescope to explore their atmospheres. 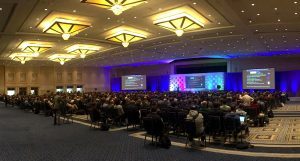 Padi Boyd (NASA Goddard Space Flight Center) next provided an overview of TESS’s guest investigator program, which just completed peer review of its first proposal cycle, receiving more than 140 proposals from the astronomy community. TESS’s large field of view and high-cadence monitoring lends itself well to a variety of projects, like exploring variability in the stars of the Pleiades, hunting for very early-stage supernovae, and exploring the electromagnetic counterparts to gravitational-wave signals. Wrapping up the session, Elisa Quintana (NASA Goddard Space Flight Center) presented on how TESS meshes with other current and future missions. She opened by explaining that TESS isn’t a Kepler replacement: while Kepler’s planet discoveries are on average ~3,000 light-years away, TESS’s will be much loser, at ~300 light-years away on average. TESS’s field of view covers a solid angle that’s ~20x the size of Kepler’s, and the mission’s goal is specifically to hunt for small planets transiting bright stars, which can then be followed up with other current and future telescopes to learn more about the planets’ properties. We can look forward to TESS’s launch in the next few months, and we have high hopes for its productivity. Though the nominal mission is only 2 years, Ricker points out that the mission won’t be limited by expendables — it could last several decades in orbit if NASA chooses to continue to fund it! I don’t know about you, but I can’t wait to see what TESS shows us. Karen Masters (Astrophysical Research Consortium / SDSS-IV), spokesperson for SDSS-IV, kicked off this press conference on the Sloan Digital Sky Survey with an overview of this fourth iteration of the program, along with a sneak peek at some of the exciting science to come from the next iteration, SDSS-V.
At the turn of the 19th century, Henrietta Leavitt was studying Cepheid variable stars, which oscillate in size and luminosity with a regular period. She noted that the period was related to the luminosity of the star, which makes these stars great for measuring distances. Sadly, it was only after her death that Leavitt’s contribution was recognised, so to go some way to rectifying this the AAS has recently decided to name this relation the Leavitt law. Much work has been done on the relation since then, but one aspect that is still poorly constrained is how the composition of the star affects the Leavitt law. Katherine Hartman (Pomona College) and Rachel Beaton (Princeton University) presented observations of Cepheids from the Apache Point Galactic Evolution Experiment (APOGEE) survey, and found that measurements of the composition of these stars give consistent results no matter at what point in the cycle they are observed. This is great because it means that, in future, we only need a single observation of a Cepheid to measure its composition, rather than observations over the whole cycle. 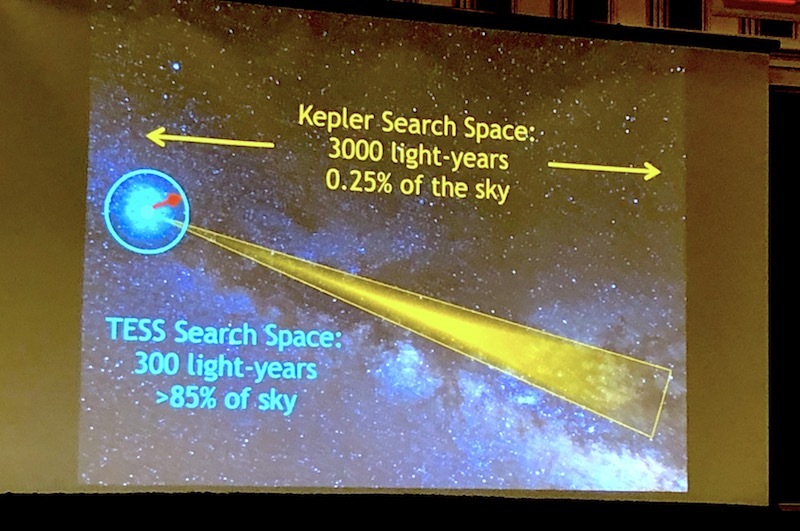 Next up, Robert F. Wilson (University of Virginia) demonstrated the power of combining datasets from different observatories, in this instance measurements of the iron content of stars from the APOGEE instrument combined with exoplanet measurements from the Kepler space telescope. The headline result is that iron-rich stars tend to host planets with shorter periods. A mere 25% increase in the iron content can have a significant effect on the average planetary period, which is intriguing since iron makes up only around 2% of the total mass of your average main-sequence star. The physical mechanism leading to this effect is still uncertain, but Robert proposed a couple of physical explanations: either iron-rich protoplanetary disks lead to formation of planets in tighter orbits, or such systems cause planets to migrate inwards from the outer disk. Supermassive black holes lie at the center of almost every galaxy and are thought to have a big impact on the properties of their host galaxies. Measuring their masses throughout cosmic time is therefore key, but incredibly difficult. The next talk from Catherine Grier (Pennsylvania State University) presented results from the BOSS spectrograph that uses a technique called reverberation mapping to measure these masses. In short, light from the accreting black hole is seen reflecting off gas in the accretion disk in real time; by studying this light, we can measure its rotation speed, which can be used to infer the mass of the black hole at the center. What’s amazing about this study is that they measure the masses of 849 black holes up to 8 billion years ago — a much bigger sample that probes much further back in time than previous studies. Sticking to the theme of supermassive black holes, Karen Masters presented evidence for these objects in non-star-forming dwarf galaxies. Her team used results from the MaNGA survey to observe the distribution of both stars and gas in these quiet, low-mass galaxies, and found an intriguing result: they aren’t moving together. This suggests that something is blowing out the gas, a process known as feedback. Fortunately MaNGA provides another piece to the puzzle: the ionization state of the gas. The ionization state is very high in the outflowing gas in these dwarf galaxies, which suggests the feedback is from the central black hole, rather than stars. Massive black holes were not expected to be an important driver of evolution in low-mass galaxies, so these results present a challenge to theory. All of the these press releases are available on the SDSS website. Astronomers are enamored with immaterial things: photons, magnetic fields, gravitational waves… But our romance with the ethereal is made possible by the material: telescopes and detectors, spacecraft and spectrometers. The careful treatment demanded by delicate and aging astronomical instruments dating back hundreds of years begs the question: why should we care about documenting and preserving obsolete artifacts from the history of astronomy? 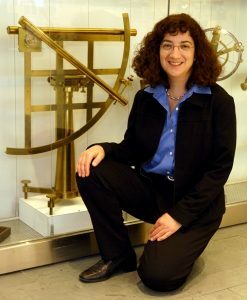 Dr. Sara Schechner, the curator of the Collection of Historical Scientific Instruments at Harvard University, answered this question with examples of astronomical paraphernalia throughout history and the effect that astronomical events have on society as a whole. She noted that outdated instruments and texts can provide insight into how people viewed astronomy in the past. For example, 17th century almanacs and instruments reflected the close kinship of astronomy and religion in that era; astronomy had yet to shed its theological (and sometimes ominous) associations. After the 1684 solar eclipse caused Harvard University’s commencement to be rescheduled (such a bad omen shouldn’t coincide with such an auspicious day), the Harvard president, John Rogers, suddenly died on the day of the eclipse — confirming the astronomical event as a harbinger of doom. By 1759, however, the first predicted return of Halley’s Comet was welcomed with awe. 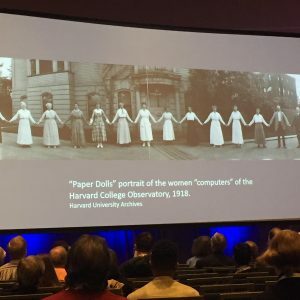 The women computers of the Harvard College Observatory. Astronomical materials can also reflect other societal shifts. Glass photographic plates evoke memories of the women “computers” of the Harvard College Observatory. Brilliant yet underpaid, the women of the Harvard Observatory classified hundreds of thousands of stars and developed the spectral typing scheme still in use today. Notably, Henrietta Swan Leavitt formulated Leavitt’s Law — a connection between the period of a Cepheid variable’s pulsation and its luminosity — which was used by Edwin Hubble for his discovery of the expansion of the universe. While the work of the Harvard computers advanced the status of women in astronomy, their success didn’t necessarily advance all women; telescope advertisements catering to male astronomers in the 1960s still featured elegant women caressing telescope barrels, showcasing how astronomical materials can reflect attitudes toward women over time. Lastly, historical materials can highlight the public’s affinity for astronomy, as well. From amateur astronomers’ efforts to track Earth-orbiting satellites in the 1950s via project Moonwatch to advertisers using the allure of the stars to sell their products, the public’s romance with the stars is well-documented in historical artifacts. Dr. Schechner summarized her talk by saying that learning about our past helps us to live critically in the present; from the public’s reception of science to views toward women, astronomical artifacts are a lens through which we can evaluate societal changes through time. You can read more about Schechner and her work in an interview by Caroline Huang. If you ever take an astronomy course that covers some cosmology, probably one of the first things you’d learn is the cosmological principle — the assumption that matter is distributed isotropically and homogeneously on large scales. A somewhat less general version of this, the Copernican principle, says that we don’t live in a special place in the universe. This is one of the most basic assumptions built into Lambda-CDM, the current leading model that describes the universe. The truth is, however, that we don’t live in a perfectly isotropic and homogeneous universe, and that these density perturbations may (or may not) have effects on what we observe when we try to study cosmology. For example, gravitational lensing causes objects behind over-densities to look brighter, and objects behind under-densities to look fainter. The Hubble diagram of Type-Ia supernovae assumes that there is no flux bias from gravitational lensing, but theorists have actually gone back and forth on what sort of effects we might see for more than half a century. 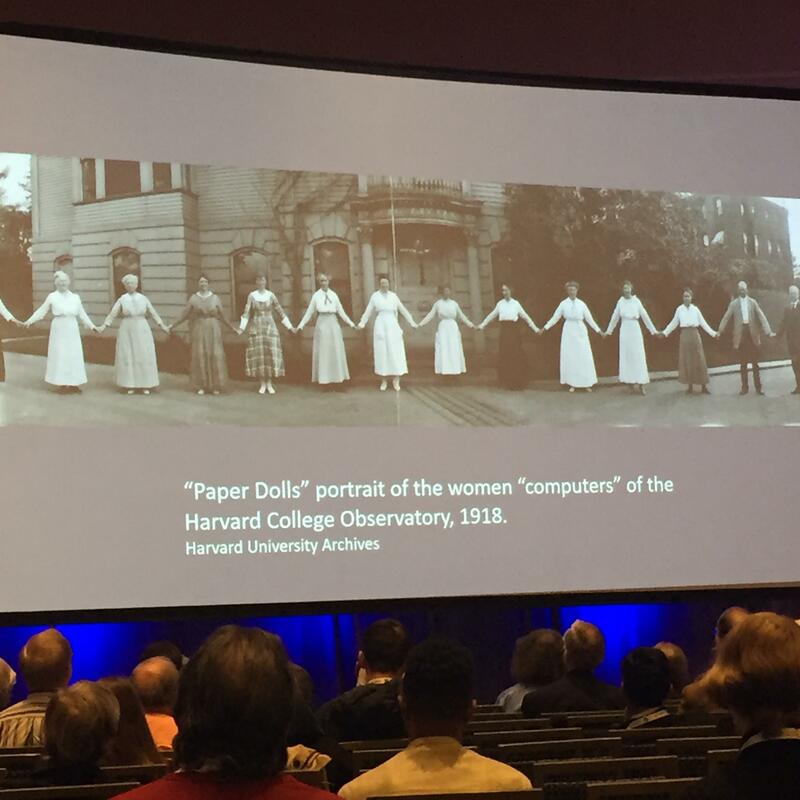 In his plenary lecture, Professor Nick Kaiser (University of Hawaii) discussed the difficulties of calculating distance as a function of redshift and the various conclusions cosmologists have come to over time regarding the effect of inhomogeneity on observables like Type-Ia supernovae. One way to think of this problem is to consider that our assumptions about isotropy and homogeneity lead us to conclude that a surface of constant redshift would be a sphere. While this true for something that is perfectly isotropic and homogeneous, when you have even small matter under- and over-densities, this is not the case. Since the universe is almost isotropic and homogeneous, there would only be very small perturbations, but that would cause the surface of constant redshift to look something like the surface of a golf ball: almost spherical, but with wrinkles. Since this could cause us to see a flux bias, it could have an effect on things we measure, like the Hubble constant. How big are these effects? In the question and answer session, Kaiser said that exactly how large these effects may be is unclear, but that he does think that it’s unlikely that they could explain the difference between the CMB and local Hubble constant measurements.